Professor Nick Lennox is the inaugural winner of the Bob Davis Award. Nick has made outstanding contributions over many years to prevent and treat health problems in people with intellectual or developmental disability. 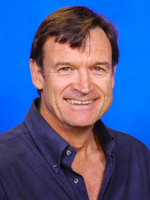 In 1997, Nick established what become the Queensland Centre for Intellectual and Developmental Disability and continues to deliver clinical services, an enviable research agenda, and advocate at all levels of government and the community sectors. A major research contribution of Nick’s has been establishing the evidence base for the CHAP, a tool to assist detection of health problems in primary health care. His ef efforts have led to international recognition of the CHAP as an effective tool to improve health outcomes in people with ID. He continues to work to develop major educational modules (MOOC), harnessing technology to deliver education about the health of people with ID to a global audience. Nick served as President, AADDM for 8 years and was instrumental in establishing this national professional organisation in Australia. As President, AADDM, he was tireless in his efforts to ensure the health needs of people with IDD were included in national strategic action plans. Nick is a widely admired person, deeply respected for his honourable, principled and compassionate approach.